Four ActiveHistory.ca editors and a larger number of past and present contributors attended a major public history conference in Ottawa last week. It was a great opportunity to share our website with the North American public history community and to learn about new projects here in Canada and in the United States. Many of the presentations focused on the growing connections between digital history and public history, as websites like this one try to reach a broad audience and museums, historic sites and archives develop a virtual presence. I took part in a round table of environmental historians involved in digital public history projects. My short presentation focused on the major contribution environmental historians made throughout the first few years of blogging at ActiveHistory.ca. My fellow presenter Sean Kheraj talked about his Nature’s Past podcast series, while Josh MacFadyen and Daniel Macfarlane covered a number of other Network in Canada & Environment online projects. 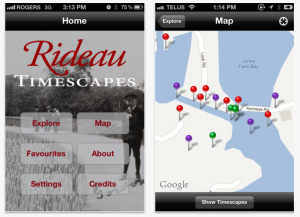 Will Knight and Jim Opp then discussed their Rideau Timescape iPhone app, which includes hundreds of historical photos of the locks throughout the Rideau Canal. I highly recommend it for anyone visiting the Ottawa region and the time-slider function is great even if your thousands of kilometers away. 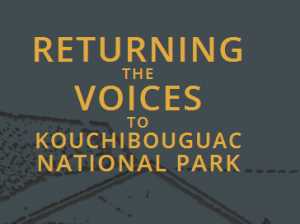 Finally, Ronald Rudin presented the Returning the Voices to Kouchibouguac National Park website on the expulsion of residents during the creation of a national park in New Brunswick. 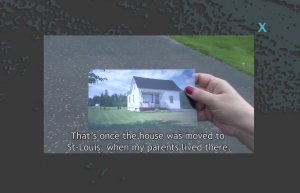 Ronald found the expropriation maps and used them to build a website that includes interviews of former residents filmed on location. The site is also set up to work on smart phones, so visitors in the park can watch the videos while exploring the expropriated lands. The combination of the map layers, filmed oral history interviews and historical images provides a powerful perspective on the social costs of national parks policy in Canada, which is timely as we plan Canada’s first urban national park in the Rouge Valley on the eastern edge of Toronto. Returning the Voices is great example of digital public history. Video of Linda Cormier talking about their house in the St-Olivier/Cap St-Louis region of the park. The following day Ian Milligan, Krista McCracken, Tom Peace and Devon Elliot presented four different perspectives on the practice of digital Active History to a full room. Ian recapped the development of ActiveHistory.ca over the past four years and showed off the history websites created by his University of Waterloo students last term. He discussed a number of the reasons some historians remain hesitant to blog, but concluded with a call for more digital public engagement by historians in the future. Krista presented the work done by the Shingwauk Residential Schools Centre at Algoma University to engage survivors with photographs, both through numerous visits to First Nations communities and through an online archive. The photographs held by the archive are of particular importance, as many of the survivors don’t have photographs from their childhood. Physical photo-albums and the web archive allow the Shingwauk Centre to connect with the survivors and identify many of the students captured in the photos. Devon impressed the crowed with some of DIY “maker” public history projects. QR codes, tiny radio transmitters and inexpensive Arduino computers allow Devon to create museum exhibit prototypes that provide multinarrative experiences. For example, visitors can carry sensors that identify them as British, American or Six Nations in a War of 1812 exhibit, allowing for different presentation of artifacts and events. This could be a great opportunity to present historical debate in a museum setting. Finally, Tom provided some cautionary words about our growing enthusiasm for the digital realm, particularly if we don’t organize related public history outreach offline, but I expect Tom will publish some of those ideas on this website in the future, so I’ll not elaborate further.